I don’t know about you, but I always associate barbecue with Summer. I love all the cookouts, picnics and backyard gatherings…lazy summer days by the lake, relaxing by the pool or just hanging out on the patio cooking up something good on the grill. What goes better for this than barbecue. This is so simple and you can use ribs as well as chicken. All you need is chicken breast, chopped onion, brown sugar, barbecue sauce, Worcestershire sauce and whatever seasonings you may like …maybe a dash of garlic powder. Place chicken, onion and seasonings in the slow cooker. In a bowl mix the barbecue sauce, brown sugar and Worcestershire sauce. 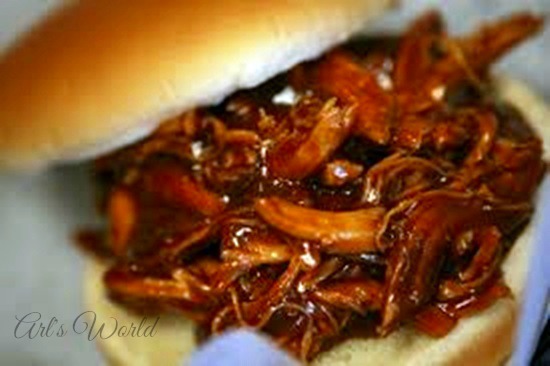 You can make your own barbecue sauce or choose to use a store-bought version, I used Jack Daniels BBQ sauce. Pour mixture over the chicken. Cook on low for 4-6 hours. Serve with potato salad, baked beans and Easy to Bake Bread or any of your favorite side dishes …maybe throw some Corn on the Cob in the menu as well. The chicken will be really pull apart tender, which makes it really easy to shred if you would like to do so and have it on bun with a side of coleslaw. Now let’s eat some Barbecue!! In a bowl mix the barbecue sauce, brown sugar and Worcestershire sauce; pour mixture over the chicken. Looks delicious! !!!! 🙂 wow!